How Many Ounces Are in a Champagne Flute? Champagne and other sparkling wine are served in a special glass called a Champagne flute. This tall, tulip-shaped stemware typically holds 6 ounces of wine, though most servers only do a 4-ounce pour. This leaves adequate room for the bubbles to settle and prevents spills and splashes. The Champagne flute has a very specific design for a reason. The long, skinny shape concentrates the wine's bubbles and holds them tightly together. Not only does it look elegant, but the design also retains the effervescence in the glass longer and keeps the Champagne tasting fresh while you drink. Flutes come in a variety of styles though most retain the same basic shape. It's very common for the rim of the glass to taper in toward the center of the glass. This design does the best job of trapping the wine's bubbles. There are also flutes that flare outward, giving them more of an open flower look. Beyond the Champagne flute, there is the Champagne saucer. This glass has a short and shallow bowl that is as wide as a cocktail glass over the top of a short stem. They're rather common at parties and were quite popular in the 20th century though they don't trap the bubbles like a flute. For those looking for vintage glassware to serve champagne, it's more likely to come across saucers and some stunning designs can be found. 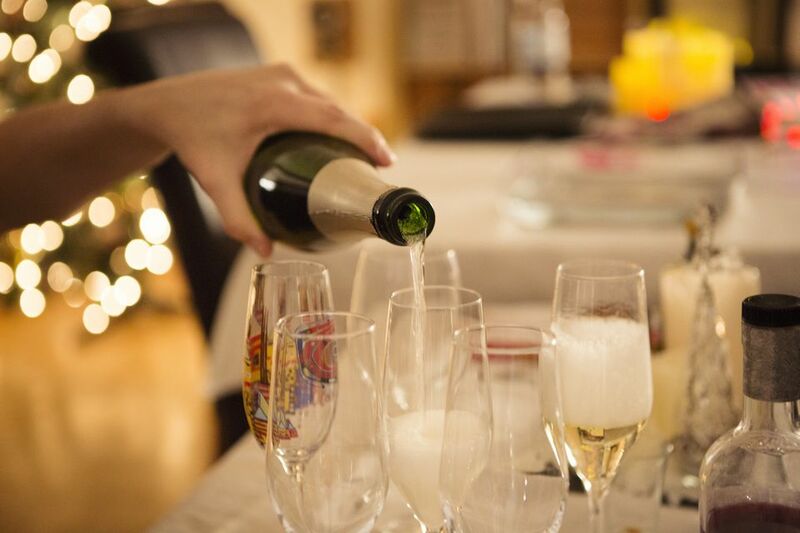 Guests tend to want the freshest Champagne possible, so it's always best to pour it as needed and right before serving. This will ensure that everyone gets the opportunity to fully enjoy the bubbles. This rule applies to Champagne cocktails as well. Prepare for service by pouring all the other ingredients into the glass, then top it with Champagne at the last minute. The best part is that the wine bubbles do the mixing for you. There are two common approaches to pouring Champagne into a flute. With either, the goal is to minimize the foam, which naturally occurs whenever a carbonated beverage is poured. There might find be one technique that works better for each individual, but that's just a matter of experimenting. The straight pour: Traditionally, Champagne is poured into a flute that is standing upright on the table. The trick to reducing the foam is to 'wet' the glass and to pour slowly. To do this, pour a splash of wine into the glass and allow the bubbles to settle, then proceed to slowly pour more wine until the glass is (at most) three-quarters full. The tilted pour: This method is the same trick that is used to reduce the foam when pouring beer. Holding the stem of the flute in one hand, tilt the glass at about a 45-degree, and slowly pour the wine onto the inner side of the glass. As the glass fills up, slowly tilt the glass upright. When it comes to any glassware, the price is an indication of quality. It is tempting to purchase inexpensive flutes, especially for those hosting a party and need a lot of glasses. In this case, it may be better to rent the glassware you need. Cheap glasses are often made with thin glass. This can be easily scratched and chipped, some will even shatter while washing, and it's not unheard of for the bowls to break right off the stem. This doesn't mean that it's necessary to buy fancy crystal glasses. Simply make sure that the glasses are not paper thin. If there is a need to guess whether the flutes are made of plastic or glass, that is also not a good sign. A good set of flutes does not have to cost a fortune, but making a small investment in them will pay off in the end. Choose flutes wisely and wash them carefully by hand, then dry them right away to keep them in tip-top shape for years.